We, at Prestige Travel specialize in private arrangement throughout Turkey. We can arrange anything from magnificent hotels, or special boutique type hotels, luxury car service, and bilingual expert guides. Traveling by cruise ship? Let us make private arrangements for transfers and sightseeing while in port. No masses of people to deal with, you will be whisked away and returned to the ship on time! Your private tour of Istanbul starts with a visit to the Hippodrome, which was one of the largest chariot race grounds of the Byzantine Empire. You will take a short walk to the Blue Mosque, completed in 1616, ıt is a triumph of harmony, proportion and elegance. The mosque was a part of a complex also including, tombs, fountains, kitchens, and a bath. Its colourful 260 windows enables the sunlight to reach inside. This makes the interior unusually light. The blue Iznik Tiles covering the walls have given the mosque its popular name, Blue Mosque. Visit the magnificent Topkapı Palace, the residence of the sultans for almost three centuries. 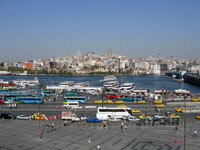 It is located on the promontory jutting out between the Bosphorus and the Golden Horn. This setting provides a magnificent view. The construction of the Topkapı Palace was completed between 1465 and 1478. Being the imperial residence of the sultan, his court and harem, the palace was also the seat of government for the Ottoman Empire. 4,000 people lived in the Palace. In the Treasury section, you will see breathtaking displays, including the 7th largest diamond in the world, the "Spoonmaker's Diamond". A visit to the Underground Cistern is a must. It was built by Justinian in the 6th century. It is 70 meters wide and 140 meters long, with a capacity of 80,000 m³ of water. It has 336 beautiful columns that support the cistern, two of which are carved with the head of Medusa on the plinth. The Rustem Pasha Mosque is an Ottoman mosque located in Hasircilar Carsisi (Strawmat Weavers Market) in Eminonu, Istanbul. It was designed by Mimar Sinan ("Sinan the Architect") for Grand Vizier Rustem Pasha (who married one of the daughters of Suleiman the Magnificent, Princess Mihrimah). Its building took place from 1550 to 1561. The mosque is famous for its exquisite Iznik tiles, set in beautiful floral and geometric designs, which cover not only the facade of the porch but also the mihrab, minbar, walls, and columns. A visit the Egyptian Bazaar, the second largest covered market in Istanbul. It was constructed in the 1660s as part of the Yeni Camii (New Mosque) complex. The name derives from the herbs, and spices imported from or through Egypt. It is still the best place to buy Turkish delight, dried fruit, exotic spices and herbs. Or you can explore ninety-two streets of the famous Grand Bazaar. The Grand Bazaar is the largest and oldest covered Bazaar in Turkey with more than 4,000 shops. A variety of Turkish Handicrafts, Oriental carpets, rare jewels and inexpensive souvenirs all sold in small shops next to each other. The streets are named according to the trades, such as gold and silver sellers, carpet sellers, booksellers, etc. 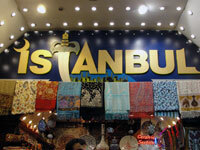 The most oriental atmosphere in Istanbul is found in the bazaar. Pasabag Valley where the formation of "fairy chimneys" can be best observed. 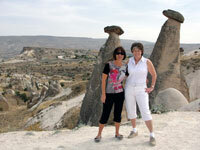 Pasabag, the Pasha's Vineyard, is surrounded by incredible natural rock formations; a spectacular scene. Then, drive down into the village of Urgup, where you will see the blending of landscape and buildings. At 5:30am, wake- up to get ready for your early morning ballooning experience. 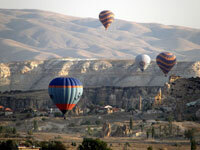 You will float over Cappadocia for one hour and see the fantastic landscape, going down into the valleys. It is an unforgettable experience! After your experience, you will return to your hotel for breakfast. Visit the Göreme Open-Air Museum where icons and other figurative representations were prohibited. The 11th century represents the "golden age" of religious art in Goreme. Then, you will visit the Goreme Valley, which has been occupied since the dawn of history. It is the valley of the churches. The wonderful and primitive 11th and 12th century frescoes cover the walls of these churches. The oldest churches in the area date back to the 6th century. Among the 356 of churches, the most important ones are The Karanlık Kilise, Yılanlı Kilise, The Elmalı Kilise and The Tokalı Kilise. Visit the House of Virgin Mary, where the Virgin is said to have lived the last years of her life. The building was rediscovered in the late 19th century by Lazartis from Smyrna based on the vision of a German nun. The site is officially declared a shrine of the Roman Catholic Church and visited by Pope Paul VI in 1967, Pope John Paul II in 1979 and Pope Benedict XVI in 2007. Ephesus, famous throughout the ancient world for its Temple of Artemis. You will first visit Odeon Theatre where the state affairs used to be held. Then, view the Hadrian Temple, It was dedicated in 118 AD to Hadrian, Artemis, and the people of Ephesus but greatly reconstructed in the 4th century. This impressive Corinthian style temple has beautiful reliefs on the porch. According to the belief of Ephesians, the Medusa head on the porch, would protect the city from its enemies. Visit the newly excavated spectacular Terrace Houses (Villas) located on top of the hill within the City of Ephesus. They were inhabited by wealthy Ephesians, and are finely decorated with mosaics and frescos. The Terrace Houses were brought to light in excavations carried out since the 1980s. Along with those in Pompeii, they constitute some of the most vivid examples of Roman domestic architecture to survive to the present. 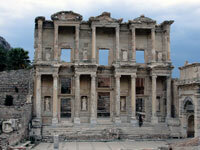 The famous Celsus Library, The library is the best preserved structure of its kind. The inscription on the side of the building's front staircase says that the library was build by Julius, in his father's honour, after his death. His father, Celsus was the Roman governor of Asia Minor early in the 2nd century AD. The Ephesus Museum. Many of the artifacts displayed here were found in Ephesus and other ancient sites in the region. Highlights include the fresco of Socrates, statues and heads of Eros, crosses, coins and the works of the 1st century AD. Such as glass trays and theatrical masks, and much more.